With Wandboard Quad, SABRE Lite, Nitrogen6X, and UDOO, we already have some choices when it comes to low cost Freescale i.MX 6Quad development platforms. Direct Insight, a British company, has developed another called TRITON-TXEK EvalKit for iMX6 that includes the company’s Triton-TX6Q SoM, for 130 GBP (about $200). The company provides a Linux BSP standard with source, toolchain, and schematics, and Linux comes pre-installed in the SoM. Windows Embedded Compact 7 and Android 4 support will be available later for an extra charge. Based on the features above, the board is unlikely to be appealing to hobbyists. However, if you plan to develop a product, it could be an option, as you could use the company SoM with your custom based board, and many i.MX6Q pins appear to be easily accessible (TBC) via the numerous through holes on the carrier board. The carrier board is also compatible with all TRITON-TX SoM based on Freescale i.MX283, TI Sitata AM3354, and Freescale i.MX6. 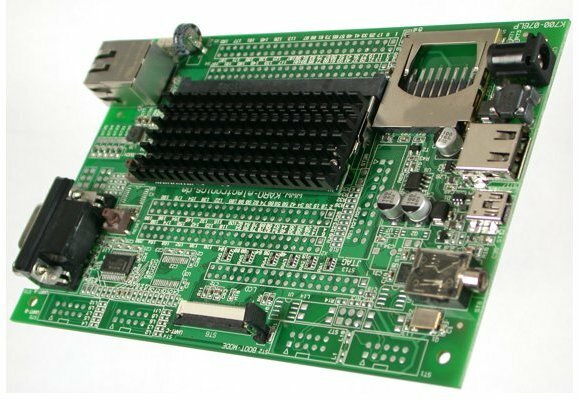 If you need a more advanced development board, the company also provides TRITON-TX StarterKit-5 for 855 GBP ($1,339). You can find (not that much) more information on Direct Insight’s TRITON-TXEK for iMX6 page, and my earlier post about the company’s TRITON-TXQ6 SoM. Thanks to Allan for the tip. Lol… It turns out Karo Electronics is indeed the manufacturer, and Direct Insight just a reseller. We can actually see karo-electronics.de on the first picture, but I did not notice while writing about it. i.MX6 is a quad core Cortex A9, the performance will be slower than Arndale and IFC6410 boards. The board above also does not have many ports available.